Hello! My name is Jarrod, a proud (and fairly new) member of the Sacramento Kidical Mass Community. My wife, three children and I moved from the suburbs to the greater downtown area in early 2012 and have fallen in love with the closer-knit communities and the thriving bicycle culture. Shortly after we moved in, we visited our local farmers market and happened upon Elle and Anna, toting their respective children (and tons of other cargo and goodies) on these big, bold bicycles that I couldn't stop admiring. They introduced themselves and told me all about their Yuba Mundo cargo bikes (and even let me take a spin) and I was hooked. A couple months later, I was off to Practical Cycle to buy a Mundo for our family. It was not an easy decision, but I felt then (and feel even more so, now) that it was a wise investment in our future. While we haven't given up our car, we have replaced a whole lot of driving with cycling, and I couldn't be more pleased with the results! Taking the kids to school, grabbing some coffee, getting groceries, and running errands are all more enjoyable and healthy on a bicycle, I have found, and the friends and experiences we have made while biking as a family unit have become quite dear. I love that, for our kids, it's NORMAL to ride almost everywhere. I also love that they are much more keenly aware of and in tune with their surroundings on two wheels than they are on four. 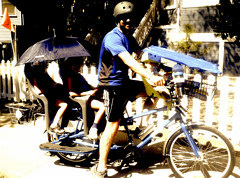 One of the best things to come from our lifestyle change has been becoming a part of Kidical Mass. Being around other conscientious people who are choosing to live and interact more outdoors--engaging with their city and with nature NOT just for an exciting weekend here or there, but everyday...even when it's not the most convenient thing to do--challenges and inspires me. Having my children be around those who make these kind of choices WHO ARE ALSO FUN? Well, that's a wonderful thing I'm thrilled to give them. Being part of Kidical Mass has been awesome! Everyone is so nice and welcoming and most importantly the kids have a blast. Riding bikes has become part of what we do on a regular basis and Kidical Mass has been a great way to meet other people who also love to ride bikes with their families.